- Size : 16 x 21 Cm. 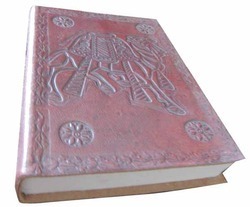 Handmade Paper Leather journal in beautiful embossed patterns and floral designs. The diaires are available in different designs and sizes. The paper used is cotton paper acid free, eco-friendly. Being a customer-oriented enterprise, we are engaged in providing a wide array of Embossment Notebook. 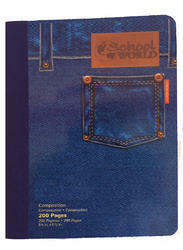 We are one of the leading organization involved in offering excellent quality College Notebooks. These are good demand in the market due to superior quality and durability. These are available with different covers such as embossed stone studded paisley designs and floral designs. Also, these are remarkable for their fine quality of paper and strengthened stitching.